In order to maximize the potential to have the best possible outcome for your insurance needs, WSA has an endorsed relationship with two insurance organizations. The Maximus Insurance Agency (aka BindDesk) is both a wholesale and a retail insurance brokerage company that offers coverage through a wide variety of insurance companies and programs. Although they can quote with World Insurance Associates, our additional endorsed program, they also work with a wide variety of other companies. You will find the agency to be familiar with the needs of the power sweeping and related industries. One of the company’s specialties is matching up the best insurer for the needs of our WSA Member contractors. Although the company is located in San Diego, CA, the agency offers service throughout the U.S. You may either utilize their team as your agent of record or, alternatively, retain your own agent in your location. WSA’s primary contact at Maximus/BindDesk is Phil Duncan, one of the firm’s founders. You may reach Phil via email sent to phil@binddesk.com or by calling 619.684.3851. The insurance professionals at World Insurance Associates LLC (WIA) have customized an insurance package designed to meet the needs of the pavement maintenance contracting community – regardless of size or scope of work. We are very proud to be able to offer this value-added program to WSA Members on a direct basis. That means you are able to continue to use your current insurance agent but get the advantage of having in place the best, most well researched, insurance program in the power sweeping industry. This insurance program offers all of the types of insurance generally required by sweeping contractors and pavement maintenance contractors large and small. Included are a number of options not generally available in the insurance marketplace. Scott Cerosky, a Principal at WIA, our WSA Members’ direct contact for this program. Scott is a multi-award winner for the work he has done for the pavement maintenance industry, including the Alan Curtis Industry Service Award and induction into the Pavement Hall of Fame. 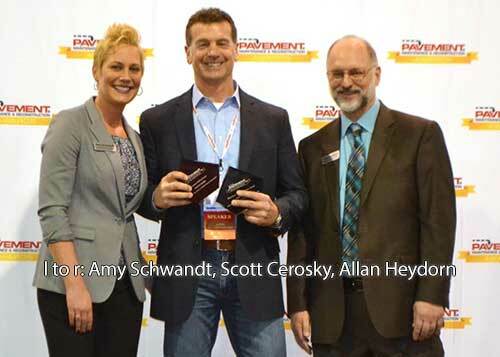 The photo to the right shows Scott receiving these awards in 2016 from AC Media, organizers of the National Pavement Exposition. You can reach Scott Cerosky by calling 914-714-0787; or, email him at ScottCerosky@WorldINS.net. Since you are able to utilize your current, local, insurance agent to take advantage of this insurance program, another alternative is to have your agent give Scott a call to provide a quote on your company’s insurance. WSA Management Team members are excited about the benefits the above insurance programs brings to WSA members and we encourage all sweeping contractors to investigate the competitive benefits the programs offer. If you have any questions for the WSA staff after contacting either of the above organizations, please let us know. My agent has been shopping several carriers over the past 2 months to get ahead of our renewal, one of which is World Insurance Associates due to your recommendation of their firm. Long story short, our current carrier was set to increase our Auto policy by over $10K a year due to, what they called, a misclassification of our prior 9 years of Auto grouping in their “preferred program”. This isn’t due to extensive claims, although we’ve had 2 in 9 years with them, but rather the underwriter claiming they made a 9 year mistake including us in that program. So, with that projected increase of $10K a year World Insurance Associates came in $7K a year lower than our expected renewal with our current 9 year insurance carrier. Although World Insurance Associates is still $3K higher than what we’ve been paying it will still save us $7K a year over the projected renewal and we’re excited for that. Additionally, World Insurance Associates quoted our Work Comp at the Arizona rates without adding a debit on top of it. We had been paying a 6% debit, despite a clean claim record, for several years with our current provider after our experience mod factor. So that will also add up to additional savings for our company. Last but not least is the GL. Our current GL carrier, which is different than our Auto and Work Comp carrier, is dropping their class code on Street Sweeping companies so they won’t even renew our policy this year. World Insurance Associates came in significantly higher than what we’ve been paying but still cheaper than all other companies, 5 of them, who have quoted all of our policies this year. So, at the end of the day, with the savings on the Auto and Work Comp we’ll still be saving money with the increase on the GL and the fact that our umbrella policy will now blanket the whole company, not just the GL. Thank you for the recommendation and I would highly recommend others to pursue World Insurance Associates and see what they can save! World Insurance Associates’ underwriter was very thorough and, even though it was a little frustrating at times due to our busy schedule, it was well worth the time to accommodate their requests.